2018 SPON Day at Jester King! Thank you very much to everyone who came our to SPON Day yesterday! We hope you had a great time, and enjoyed good food, drink and community with friends and family. As far as the spontaneous beer and wine we have left today, here's the list. Everything is available by the glass and to go unless otherwise noted. We're open from 12-9pm Sundays (kitchen closes at 8pm). Hope to see you! ...and a few by the glass surprises! Mulled wine & holiday spirit! Finally, when you need a break from spontaneous beer, $1 off of every pour of Colonel Toby will go to Casa Marinate. SPON Day (Saturday, December 8th) will feature a very special lineup of SPON beers by the glass and in bottles to go. The list represents six years of spontaneous fermentation at Jester King. We hope to see you on SPON Day this Saturday! 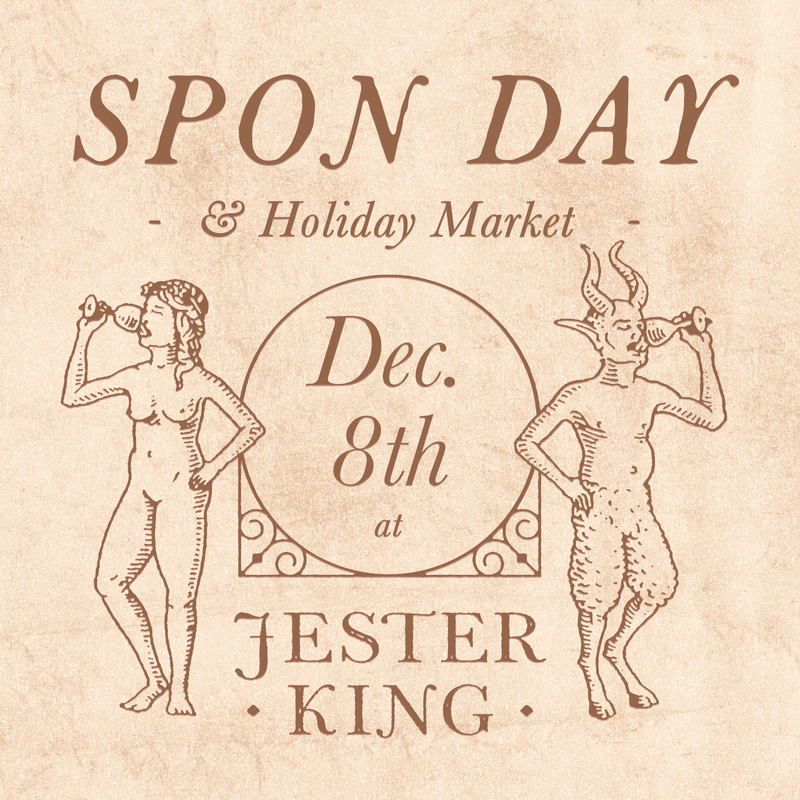 Our SPON Day on December 8th at Noon is a celebration of spontaneously fermented beer and wine. To this end, we'll have an excellent selection of spontaneously products to share. Here's the list below for the 8th! More updates to come this week! Hope to see you on the 8th! We're excited to announce that Saturday, December 8th is 2018 SPON Day at Jester King! 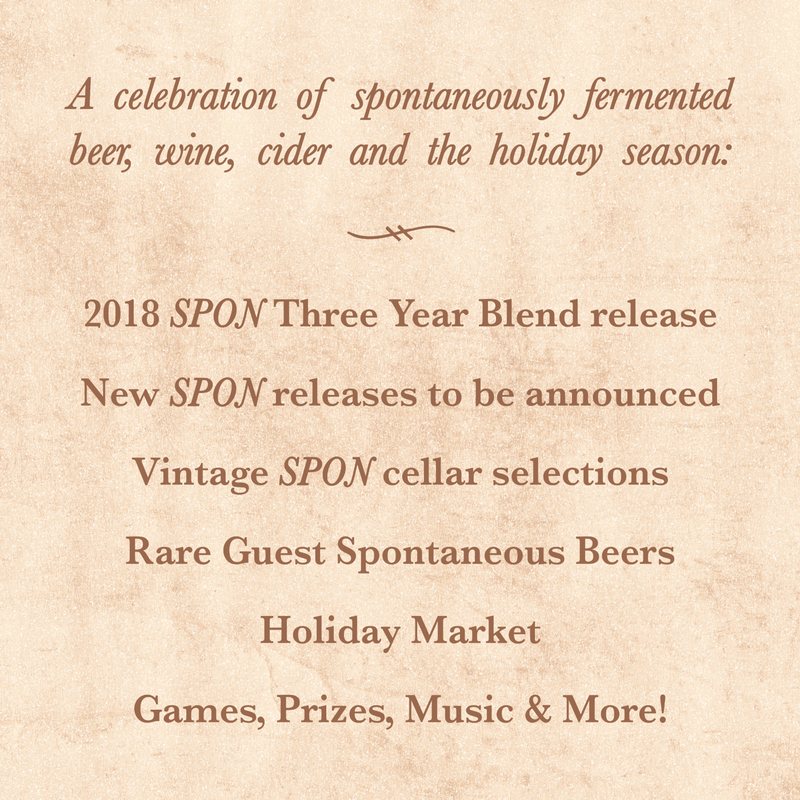 SPON Day will mark the release of our 2018 SPON Three Year Blend, as well as celebrate spontaneously fermented beer and wine from some of our favorite producers! ...and good holiday vibes to be had! We'll be rolling out all the details between now and December 8th. The event is open to the public (no ticket required) and will start at Noon on the 8th and last until supplies are gone. SPON Day at Jester King was inspired by our dear friends Frederique and Brian at Schera's Algerian-American Restaurant in Elkader, Iowa. Schera's hosted the inaugural SPON Day earlier this year. Why "spontaneous"? To us, spontaneously fermented beer and wine are achieved without the brewer or vintner pitching (adding) yeast or bacteria at any point in the process. The fermentation is 100% reliant on naturally occurring microorganisms from the ambient environment. We love and embrace spontaneous fermentation because of its potential to create unique, exciting, often puzzling flavors and aromas. We believe it's the ultimate partnership with nature when it comes to making beer and wine. The finished product is tied to the intersection of time, place and people never to be recreated. SPON Day is one of the ways in which we support and promote the category of 100% spontaneously fermented beer and wine.